People that love the medieval theme and dragon adventures will quickly fall in love with Mystic Dragon. The slot game features a big number of favorite characters like knights, princesses, and dragons. It is a fast-paced game that has simple rules and great animations. Are you eager to start your medieval adventure and test your luck? The following review will acquaint you with the most important rules and characteristics of Mystic Dragon. Every element will immerse you in the medieval atmosphere of the game. Fire breathing dragons and erupting volcanoes mark the beginning of this fairytale adventure. The background music and additional sounds create the perfect ambience. Mystic Dragon has numerous customization options. The auto play function is a great addition, giving the player some more flexibility. If you want to relax and just observe this online slot game, you will simply need to turn auto play on and sit back. 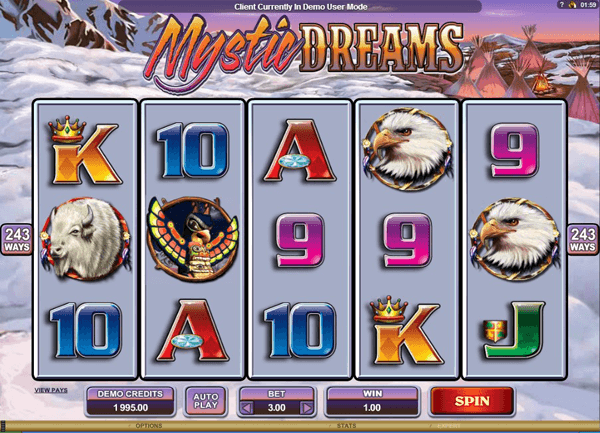 Enjoy the fun gambling experience of the five reels and 25 paylines of Mystic Dragon. Players have to choose coin sized before making bets. The game has a huge variety of coin denominations. There are 15 possibilities to choose among and these range in size from 0.01 to five. All 25 paylines are available for bets without any restrictions. All winning combinations are paid from left to right on active paylines. The winning direction is not available solely for the Volcano payouts. The dragon and the volcano are the two most important symbols in this game. The first one is the wild symbol, while the volcano plays the role of the scatter symbol. The dragon can substitute the other symbols, except for the scatter symbol, in order to complete a winning combination. The wild symbol is a multiplier – when you have a winning combination, the symbol doubles it. The second, third and fourth reels are the only places where the dragon symbol will appear. This symbol makes the game really rewarding – if you have enough luck to get three wild symbols in a winning combination, your bet will be multiplied by eight. As already mentioned, the volcano is the scatter symbol. If this symbol appears anywhere on the reels, you win. Having three or more of the volcano symbols starts the free spins mode. The winning amount will be increased two times during the free spin round. Another bonus spins can be activated during the first free spin, if you get an addition set of scatter symbols. If you’re really lucky, you can get up to 1,000 free spins in Mystic Dragon. The other Mystic Dragon symbols bring good payouts, as well. The Knight symbol in a combination with three wild symbols can produce winnings of up to 20,000 coins. Players can win from 1,500 to 12,000 coins, if they have the Princess symbol and three wild symbols in a winning combination. Mystic Dragon provides a lot of betting flexibility, which is great for beginners and for more experienced players. This game comes with a lot of variety and with great payouts, as well. All of these features make Mystic Dragon worth the try.